How many players can play Path of Exile locally (couch co-op)? How many players can play Path of Exile via system link or LAN? How many players can play Path of Exile online? How do you begin a co-op session in Path of Exile? How does save game progress work for co-op play in Path of Exile? Can I join a game if the host is further along than me in Path of Exile? What sort of things can I expect to pay for in Path of Exile? How is loot handled in Path of Exile? Can players trade items? None, it's an online game you silly goose! If your LAN is connected to the internet, you could all play together, but in keeping with the spirit of the question, Path of Exile does not support offline play of any kind. 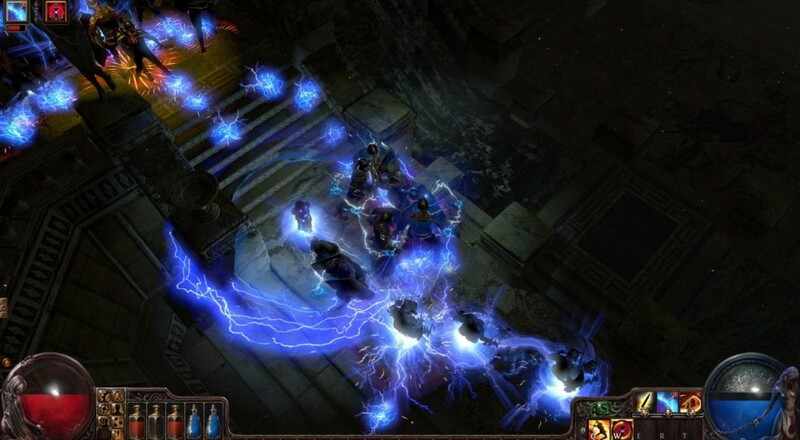 Path of Exile's maximum party size is six players. Ergo, six players may play together online. Simple. There are several ways. The easiest is simply to invite people directly from your in-game Friends list. In-game towns act as social hubs and you can recruit players through chat, or you can set up party requests through the posting board in town. Each player's progress is independent. If players are not on the same progression level, you can always backtrack to catch people up. Yes. As stated, a party can backtrack as far as necessary to catch people up, or simply adventure together. Unlike many other free-to-play games, Path of Exile doesn't lock out any gameplay via a paywall OR forced grinding. Things you can pay for generally fall into four categories: alternate effects for your spells/weapons, alternate character animations, account-level convenience items such as extra stash tabs or character slots, or non-combat pets. Additionally, you may purchase "Supporter Packs", which provide in-game currency as well as a variety of bonuses. These are inspired by Kickstarter reward tiers, and are priced as such. In keeping with tradition, all loot dropped in-game is visible by every player. Want that hot sword? Be prepared to race for it. Otherwise, ask your co-op partner to trade it to you. Yes, you can trade items.